We have created the ultimate Zorbing venue. Perfectly situated to London and the South of England, Go Zorbing offers unrivalled ex-hill-eration for any and every occasion! 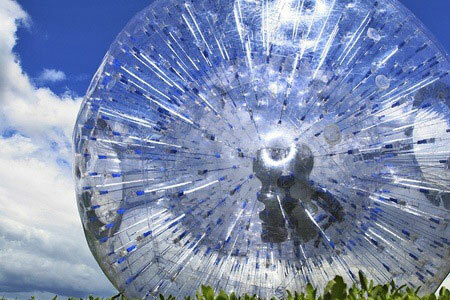 Born in New Zealand, Zorbing is a new adrenaline experience that involves hurtling down a hill in a huge inflatable ball - an unreal experience with a true fun factor that really needs to be experienced to be believed! With a full choice of Harness Zorbing, Aqua Zorbing and Black Hole Zorbing, we offer the best, most professional downhill Zorbing experiences available anywhere in the UK. Our purpose built Zorbing run has been professionally designed to be the perfect distance for downhill Zorbing and we have the best equipment & facilities to be found anywhere in the UK. Our Zorbing balls are custom built by the industry’s best manufacturer and are constructed with a polythene inner capsule suspended from thousands of nylon strings creating a safe comfort zone for your head-over-heels ride. Our friendly team are on hand to make sure you have the most amazing Zorbing experience. Call us now on 0208 935 5638 or book online for the experience of a lifetime. After setting the standard for Zorbing events in the UK for years, we have been working closely with our manufacturers to raise the bar once again, creating something completely new and totally unreal for our customers. You can now be amongst the first people in the world to try this epic new ride as a part of your Zorbing experience with us!